It is time to see what TaylorMade golf balls can do in my un-scientific test to find the best golf ball on Earth. I have never really played TaylorMade balls over the years. From time to time I would put them in play if I found one but nothing about them begged me to play them. 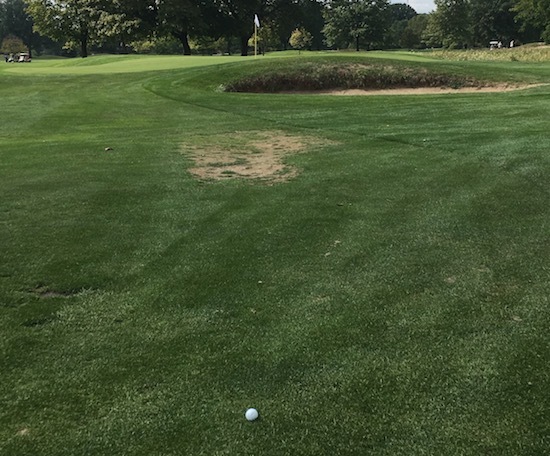 All of my golf ball reviews are done at Rackham Golf Course in Huntington Woods, MI. I play there once a week during the summer and its right down the street from my house. When I test any TaylorMade golf ball I will update it here. All of my reviews will be done in chronological order. I picked up a sleeve of TaylorMade TP5x golf balls the last time I went to Carl’s Golfland. I asked the kid behind the desk to pick some balls he’d play with price being no issue (I had a gift card). One of those was the TaylorMade TP5x. Before I headed out to the course I did some reading about them. 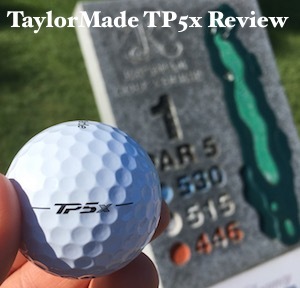 Turns out the TP5x is a five piece golf ball (hence the 5) made out of a Tri-Fast Core and Dual Spin Cover which delivers “Progressive Compression for Maximum Energy Transfer”. There’s also some mumbo jumbo about “the contrast of an ultra-soft cast urethane cover and a semi-rigid inner-cover creates maximum interaction between the cover and club grooves, resulting in exceptional spin performance with full wedge shots and pinpoint control from around the green.” Blah blah blah blah. 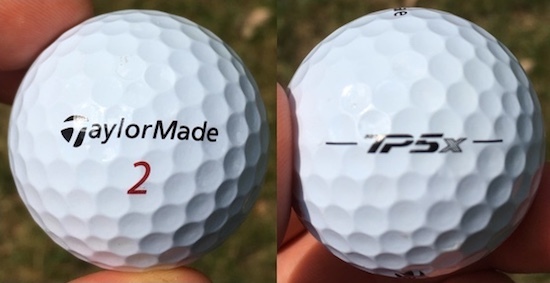 I prefer TaylorMades slogan for the TP5x: The Most Complete Tour Ball. Ok. I can work with that. Saddle up buttercup. Off The Tee – I really liked hitting the TP5x with driver. Had an odd day off the tee. Hit above average distance drives on #’s 1, 6, 7, 9, 10, 11, and by far the longest I’ve ever hit a drive on #17. None of those shots had a draw as they all went straight and high with little roll (how I normally hit driver). Drive on #17. A 300 yard Par 4. 25 Yards to the green. I sprayed all of my other tee shots right with two bad slices. Not saying it was the balls fault but I also popped one up. It seemed like the harder I swung the more control the TP5x wanted to give back. The sound coming off the driver face with the TP5x is sweet too. You can tell it is a premium golf ball. Only hit 4 fairways which is way below average. 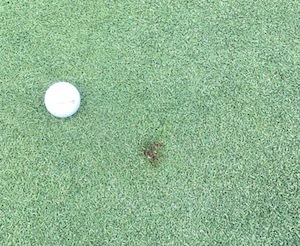 Some of those were close to the fairway but in the fairway is all that matters in this test. Fairway Woods & Hybrids – I think this is where the TP5x really shines as the ball was flying off my 3 and 5 wood along with my 4 hybrid. After hitting a big drive on the Par 5 7th that just went off the fairway I was left with 265 yards to the green and I had to hit it under a tree branch. This was the best look I’ve ever had on a second shot to this green. I hit a piss missile with my 3 wood. It went dead straight and almost rolled up onto the green. Came up 5 yards short. This was at least 5 yards closer than the Nike PD Long I hit last week. The TaylorMade TP5x had the best compression and feeling I can remember hitting any fairway wood or hybrid. The ball felt like it smushed. The only time the TP5x stopped. Irons – And this is where things get a little shaky with the TP5x. I know it is a premium golf ball but the TP5x did not compress with the irons like a Pro V1 does. That nice soft feeling was not there. Outside of one well struck 7 iron on the Par 3 8th where I put it on the green I could not get anything going with irons. Distance was there. Accuracy was not. Was all over the place. And when I did hit the green the TP5x rolled out. I can’t remember fixing that many ball marks today. Out of my 7 greens in regulation today only 2 were from full iron swings. I guess this makes sense since TaylorMade says the TP5x has a low iron spin. Wedges – I used these a lot today from the distance I was getting with driver and fairway woods. Not once did the TP5x check up or show any spin at all on the greens. Everything rolled out. Like, everything. Getting golf balls to backspin or check up isn’t something I try to do but it does happen when I hit the Pro V1 and even the Vice Pro Plus. I do not agree with TaylorMades claim that the TP5x has the highest wedge spin. Putting – I had 4 one putts, 3 three putts, and a four putt. This was probably the least exciting day of putting I’ve ever had. Outside of a 10 footer I made to save par on #2 there was nothing going on. Nothing was getting close. The four putt was just embarrassing as I put my tee shot on the #13 green with a 5 wood which is hard to do at 204 yards. Might have been the third time I’ve ever been on. And then to 4 putt. DAMMITTT!!! Maybe 5 layers is too many layers. It has a soft feel leaving the putter face but just feels like its missing something. Or maybe there is too much of something covering up the good parts. Had 37 putts. No BUENO!!! Durability – I would like to tell you I played all 18 holes with the TP5x but that would be a lie. I lost one and am 99% sure somebody playing the 18th hole picked up my approach shot on the 15th hole. I was left of the fairway and behind bushes from 170 yards out and could not see the green. I smoked my 4 hybrid and all I could see is it heading towards the green. The guy I was playing with said he saw it hit the back of the green and bounce over. There is no reason why I should not have been able to find it besides somebody picking it up. I did not give myself a penalty shot. The TaylorMade TP5x is a premium golf ball. No doubt about that. Distance was very long with driver and fairway woods. But I did not feel confident with irons and wedges. And putting was less than spectacular. Maybe its just me but the TP5x felt softer flying off the woods taking a full swing than it did with half shot wedges and 10 foot putts.